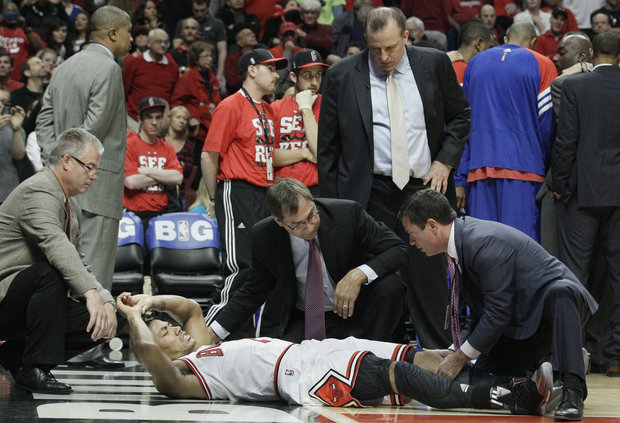 Bulls Derrick Rose sustains a devastating knee injury. Derrick Rose suffers an ACL injury and remains out. Most of the top 2012 sports stories in Chicago had no championships and little playoff action involved. Some had no action and plenty of injuries. In fact, plenty of the biggest news events had negative overtones. The order may be different depending on your favorite sport/or team’s situation. My look has to do with the impact of the story. 1. Rose injury: On April 28, the Bulls were just a minute away from beating the Philadelphia 76ers in game one of the playoffs. Derrick Rose was driving to the basket and tore his ACL. The Bulls lost that playoff round even though they had the best regular season record in the NBA. Rose is still rehabbing and hoping to return in 2013. 2. Cubs lose 101 games: They had not reached the century mark in losses since 1966. Players were traded, the offense was horrible and the fans were scare at season’s end. What a way for Dale Sveum to start his managing career and a tough year for new President Theo Epstein. And a roller coaster ride for Bryan LaHair: starting first baseman, then platoon, All-Star selection, benched and finally out righted. 3. Bears fire Angelo and hire Emery: The Bears came off another season without playoffs and fired Jerry Angelo and his spotty draft record to hire Phil Emery. Angelo is credited for trading to get Jay Cutler and signing Julius Peppers; however, his first round draft selections were usually misses. Of course, Emery pulled off a great deal by acquiring receiver Brandon Marshall from Miami. His draft picks still need to be analyzed in the next year or two. The Bears GM was not allowed to fire head coach Lovie Smith. It will be interesting to see what he decides to do this year. 4. Bears stumble after starting 7-1: With one game left, this story can go up or down on the list. If they can get into the playoffs and win a game or two is could be a great comeback from the dead-end story. If they lose out of the post-season they are just---dead. Injuries and poor offense plagued this team and it may cost Lovie Smith his job. 5. Sox Phil Humber perfecto: Perfect games are rare. Humber pitched the gem April 21 against the Mariners in Seattle. It was his first complete game in his career. Humber struggled most of the season, fell out of the rotation and is now with Houston. 6. Ryder Cup-Medinah Illinois: The eyes of the golf world watched the Ryder Cup in one of the golf course gems of the world. After the USA built a large lead, they suffered one of the biggest sports collapses to the Europeans. 7. Blackhawks locked out: As the year closes out, there is still no hockey for next year either. Blackhawks fans last memories of the Hawks are their ouster from the first round of the playoffs. Again. 8. Ronnie in the Hall: This was a bittersweet moment. The Baseball Hall of Fame enshrined the late Ron Santo. His widow Vicki spoke at his induction on July 22. Many were miffed that the honor only came after the Cubs favorite had died. 9. Notre Dame undefeated and #1: It was a magical fall with the Fighting Irish gaining momentum and rising to the top of the college football world. Linebacker Manti T’eo returned to play his senior season and had a terrific year, he hopes to cap it off with the national title in Miami on January 7. 10. Bears Urlacher bothered by injuries: The story of Brian Urlacher’s knee injury sustained coverage throughout mini camps and training camp. It lingered through the season until he injured his hamstring and was sidelined for the regular season. Now fans are wondering if he will be wearing a Bear uniform in 2013, since he is a free agent. 11. Sox have a new GM: It wasn’t a firing but top White Sox brass moved up the management ladder. Ken Williams handed the reins of the General Manager job to his longtime assistant Rick Hahn. It was not a surprise. Williams will oversee all aspects of the team. 12. Concussions and sports: Blackhawks had major concussion issues with their team captain Jonathan Towes and Marian Hossa. The Bears lost time from Jay Cutler, Devin Hester, Earl Bennett and Shea McClellin due to concussions. The topic of this type of injury has been a major concern for all level of sports. What would you chose for your top 2012 Chicago story?